For the love of Pete, enough! We have recently reviewed some so-called “smart” watches and it has not gone well – more on that later. Now we’re all being graced with the Montblanc adaptation tech twist that will be over advertised and under sold like most of their timepieces. If it wasn’t for the big bucks at Richemont group, poor Montblanc would not even have watches in the United States. This is a fact. They should stick to pens. A tech-smart e-Pen, now that’s a good idea for them! This bottom of the bracelet gadget is gimmicky and is not going to make it. Every watch collector knows the worst placement you could possibly have for damage is at the bottom of the wrist or buckle area of watches. It is the first place to scratch, ding, break and bend. It’s why the term “desk diver” was invented by fliprs to describe minor signs of wear in this location. One thing is for sure, strapping this dumb band on your watch will not make it any smarter. 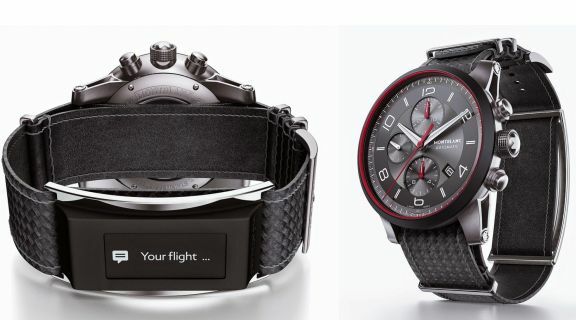 Specs on the Montblancs e-Strap were announced in January 2015. It was launched as part of the brand’s Timewalker Urban Speed collection. It can be purchased separately from the watch. It measures 40mm x 14.2mm and 9mm thick. The screen is 128px by 36px and is a 0.9″ monochromatic OLED. It has a micro-USB port and stays charged for up to five days. You can use it with your Android or iPhone to make calls, send texts, check email, or track activity. It is water and shock resistant.